Trans fats are made when a hydrogen atom is added to unsaturated fat. During this process, hydrogen gas bubbles through the oil while in the presence of a nickel catalyst. Originally just an interesting science experiment, the result became attractive to food manufacturers looking to increase profits. Trans fats don’t spoil as readily as other oils, they don’t break down when heated repeatedly, and they can turn a liquid oil into a solid, which makes transport easier and offers a cheaper substitute to solid animal fat. The fast food industry saw appeal, with most every major chain finding a use: Dunkin donuts began to use them for frying donuts, McDonalds used them for frying its french fries. (They and most others have recently eliminated trans fats due to public pressure). Margarine, is a trans fat the remains a supermarket staple which along with baked and snack goods benefited from an increasing concern over the use of butter and lard several decades ago and the desire to shift to a vegetable based product. But as trans fat consumption increased radically, researchers began to be concerned about its impact on health. Awareness of the harm of trans fats began in the 1990s, though a study done in the UK as far back as 1981 raised some questions. In 1993, Harvard concluded that the intake of partially hydrogenated oils increased the likelihood of a heart attack. That study suggested that replacing just 2% of energy from trans fats with healthy unsaturated fats could reduce the risk of coronary heart disease by a third. In 1999, a joint study by Harvard School of Public Health and Brigham and Women’s Hospital reported that “at least 30,000 and as many as 100,000 cardiac deaths a year in the United States could be prevented if people replaced trans fats with healthier non hydrogenated” oils. The New England Journal of Medicine reported that same year that trans fats are directly linked to the development of diabetes, cancer, and cardiovascular disease. Today we know that trans fats increase LDL, the low-density lipoproteins, especially the smaller denser particles that we now know are more damaging to the arteries. (More on this soon.) At the same time, they reduce HDL, the high-density lipoproteins that are responsible for taking bad cholesterol and waste that needs to be returned to the liver for processing and disposal. They also create inflammation, which has been shown to lead to heart disease, stroke, diabetes, and many other chronic conditions. Trans fats have also been linked to obesity and insulin resistance as well as Alzheimer’s disease. When you eat at bakeries, restaurants, schools and cafeterias there is no way to monitor trans fat presence, so there’s a good likelihood you are consuming them unless you are in a trans fat free zone. Trans fats do occur naturally in some meat and dairy products, so it’s hard to avoid them completely. The American Heart Association recommends that no more than 1% of your calorie energy come from trans fats. If you eat a 2000 calorie a day diet, that is 20 calories, or less than 2 grams of trans fats a day. Given what you likely ingest through your daily meat and dairy consumption, you are most likely reaching or exceeding that amount through natural sources, leaving no room for ANY additional trans fat consumption. Prior to 2006, when trans fats were finally required to be listed on labels, it was hard to tell which foods contained them. Now it’s a little easier, but you still cannot depend on full on truth in labeling with regard to trans fats. 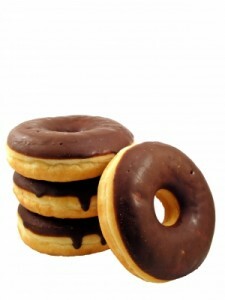 In fact, many products claim to be trans fat free while still containing trans fats. Portion sizes under .5g per serving do not require listing on labels. (In Canada, it’s .2g). So some manufacturers simply reduce portion sizes in order to meet the minimum requirements, but continue to process foods the same way. Despite the common belief that they have been banned, the hydrogenated and partially hydrogenated oils still abound in the foods we eat. The only way to know for sure if to read the label and to look for partially hydrogenated oils on the ingredient list. Land O’ Lakes Margarine spread per tablespoon has 2.5 grams of trans fat (more than an entire day’s limit) It may surprise you where you find them; I found them in a jar of artichoke hearts! Author: Inger Pols is the Editor of the New England Health Advisory and Author/Creator, Finally Make It Happen, the proven process to get what you want. Get a free special report on The Truth About Sugar: It’s Not All Equal. Learn more about Inger and receive her free bestselling ebook What Your Doctor Isn’t Telling You.